What a visual treat! I checked this out of the library intending to only look at the pictures, but my friend, Stephanie encouraged me to read the whole thing. It opened up a world for me that I did not totally understand. I rewatched the whole series with a more educated eye, and it made it even more enjoyable (if that is even possible). This is written by the niece of the writer of the series, Julian Fellowes. She organizes it according to different topics: family life, society, change, life in service, style, house and estate, romance, war, and behind the scenes. It made me want to visit Highclere Castle! I had entered a sweepstakes to go there everyday between February and April, and would you know, I would find out the week I read this book, that some guy in Ohio won and not ME! WAAAAH. Guess I will have to settle for the book, but that is not such a bad alternative! I highly recommend it. It is spendy. So, see if your library has it. My back is really cooperating! I have not been taking time to write lately. So I will do a short update before my day gets going. I had every intention of getting through Acts this September, but I bogged down at the stoning of Stephen and decided to take more of a break. I have been walking and praying and enjoying God's presence. That is nice. Yesterday was a day of agitation that I have not experienced in quite a while. I think it was because I started the day saturated in Pandora praise. Not the contemporary stuff but old hymns set in a contemporary style. I danced around the kitchen and just loved my morning. Then I had a little back scare as I put something in a lower shelf. That made me fearful of ten million things. I took the kids to their ortho appointment and started out rattled but ended up at peace. That continued when Paul had piano, and I went back to sitting in a chair and praising more. Maybe the enemy didn't like my morning? Most lists of "Great Books" only include Faust: Part I, but both Invitation to the Classics and The Book of Great Books list the whole thing. After a few false starts, I read some reviews and settled on a rhyming version that made it much easier to get through. I read it myself for a while, but I found the "text to speech" on my Kindle got the cadence of the rhymes much better than me. So, I enjoyed listening to it as I worked on my photo books. Since I know the story of The Iliad and other classical stories (thank you Susan Wise-Bauer of The Well-Educated Mind), it wasn't too hard to get through. I cannot imagine reading it with no prior background though. "Without willing it, I had gone from being ignorant of being ignorant to being aware of being aware. And the worse part of my awareness was that I didn't know what I was aware of. I knew I knew very little, but I was certain that the things I had yet to learn wouldn't be taught to me at Washington High School." I think I started to read this when it was given to me as a gift in the late 90's. Maybe not this particular Maya Angelou book because that one had some pretty gritty language that I didn't appreciate. While this one has a bit, it is mostly her childhood reflections from her earliest memory of being in Long Beach, CA and being sent as a toddler with her brother (without an adult) to Stamps, Arkansas to live with her grandmother. I had a very productive week! 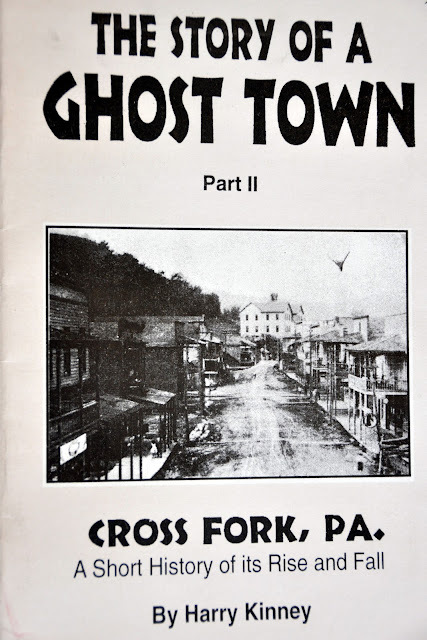 These are very short books about my grandmother's hometown, Cross Fork, Pennsylvania, written by a man who was the son of my great grandmother's younger sister (making him my grandmother's cousin who was fourteen years younger). We visited there on our vacation in July, and it was an amazing trip. I have dreamed of traveling there for 22 years, ever since I went to the LDS Church to research my family genealogy so I could fill out my wedding book (being the youngest of all the grandchildren and getting married later in life, my grandmother was already dead, and I couldn't pepper her with questions). This town is so out of the way in the Pennsylvania Wilds of north central Pennsylvania, but a wedding of a dear friend in Pittsburgh combined with having saved for fifteen years for a trip to Washington, D.C. and my desire to go to the place of my ancestors, made it the time for us to combine it all together in one plane ticket. SO worth it! Awesome and brilliant. I didn't realize it was a novel. From some reason, I thought this was a non-fiction book about the meat packing industry in America. It is SO much more. He writes so wonderfully! Do not get me wrong. This is a propaganda novel for socialism! The last part is very "preachy" on that score, but it is still brilliant. How strange that I would be reading it at the same time I have been doing genealogy research on the Swedish side of my family. My grandparents came as single people in 1923, met, and got married in Chicago, Illinois. What guts. I am sure they experienced great hardship but they ended up millionnaires in the end. Click here to view this photo book largerStart your own Shutterfly Photo Book today. (Should I do books for SEA and Mexico or just order the prints?) - Just ordering prints. Too expensive and a hassle. George says that the purpose of Labor Day is to rest from your labors, but I worked all day on pictures! Homeschool Things I Cannot Part With.jpg, originally uploaded by carolfoasia. Tuesday would have been the beginning of a whole new school year. I hear the younger moms online talking about curriculum, and it makes me miss those days. I love my life now, but I do miss homeschooling, especially the day after Labor Day!